A family photograph brought to Scotland by a Canadian visitor has recalled a moment in the history of the Glenturret distillery from the beginning of the last century. 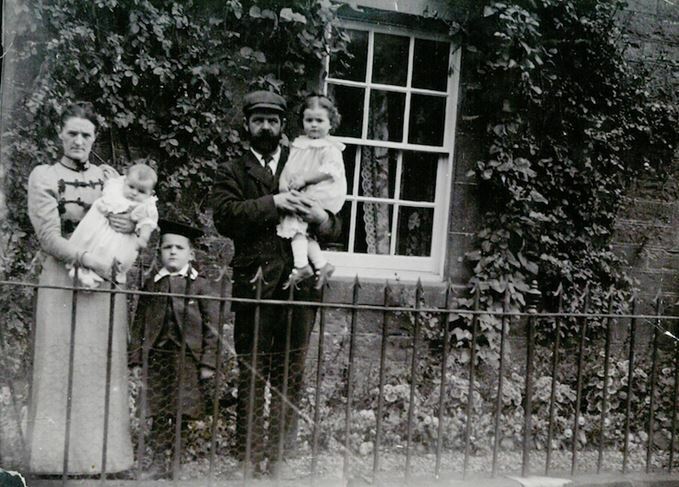 The image, taken outside what may have been the distillery manager’s house in about 1902, shows Glenturret brewer John Stormont with his wife Mary and their three children: baby Mary (in her mother’s arms), George and Jane. The family emigrated to Canada just a few years after the picture was taken, in 1905, and only the two little girls were to survive beyond the end of the First World War. George, who served with the Canadian Exemplary Force in the war, was wounded and died at the age of 23 in France in August 1918, just three months before the Armistice. Meanwhile, his parents John and Mary died of influenza in the same year. Sisters Mary and Jane lived out their lives in Canada, with Jane marrying an ex-British police officer. The sad family saga came to light when Jean Brown, Jane’s daughter, who lives in Blind Bay, Canada, retraced her grandfather’s footsteps last year and visited Glenturret. She got in touch with staff at the distillery in Crieff to add his history – and this photograph – to its archive of former employees. ‘Jean’s photograph is a valuable addition to our employee archive, enabling us to illustrate the importance of the people who make our whisky,’ said Glenturret general manager Stuart Cassells. ‘Our former stillmen and brewmasters will have used exactly the same techniques and, in some cases, equipment, as we continue to use today at Glenturret.